It often happens in our modern, youth oriented and scientifically informed culture that people consider an ancient scripture like the Shrimad Bhagavatam an irrelevant, old book, good--at best--for a doorstop. Anticipating this bias I thought I would try to help you enter into the world of the revealed spiritual literature of India, the Vedas, and specifically the Shrimad Bhagavatam. The Vedas were originally an oral tradition compiled or put into written form 5,000 years ago by the legendary Vyasadeva, the literary incarnation of God. Books then are considered a sign, not of advancement of human beings, but an indication of our deteriorated intelligence and memory. In any case, after finishing his great work, which included the four main Vedas, 18 Puranas, 108 Upanishads, and such epics as the Mahabharat and Ramayan, Vyasa was still not satisfied. By carefully thinking over the matter he understood that the reason for his dissatisfaction was that he didn’t specifically and emphatically glorify Krishna and the pure path of returning to him in the spiritual world. As he was reflecting thus, his Guru, the saint (Rishi) Narada Muni appeared on the scene. Narada confirmed what he was feeling and urged him to perfect his many literary accomplishments by going into a devotional trance to receive the inspiration to give the world its most important scripture, the Shrimad Bhagavatam. Although this is my subjective opinion, it is shared by many great devotees and even scholars of the modern age. It remains to be confirmed by you through your study of this great work. This great literature is glorified throughout the Vedas and in is own pages as the cream of cream of these scriptures, or the emperor of all scriptural canons. So great and important a literature it is that Shrila Bhaktivinode Thakur, the pioneer of spreading Krishna consciousness throughout the world, has opined that if all the other Vedas were lost and only this book remained, there would be no loss! In Christian terms we might consider it like the New Testament of the Vedas superseding all other works. If you know the treasure of the Vedic literature this is quite a claim. Shrimad Bhagavatam is considered in the Garuda Purana to be the commentary on the Gayatri mantra (a special series of prayers chanted by spiritual initiated persons which also is mentioned in the Bhagavad-gita to represent Krishna). It is called the “paramahamsa samhita” or treatise for the swan-like pure hearted sages. Such sages treasure relishing the nectar of literature which contain the sweet taste of pure devotion and the lila or pastimes of Krishna and his incarnations. 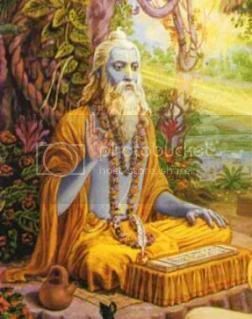 The Brahma-sutras, or Vedanta-sutras summarizes all the Vedas or puts them into codes, and these are commented on by their author, Vyasadeva, in his mature realization in the pages of Shrimad Bhagavatam. Originally this knowledge was given by Lord Brahma, the empowered creator or engineer of the Universe, in four verses. These seed “shlokas” have been expanded into today’s book of 18,000 verses. The Bhagavatam—as it is also called in shortened name—was Lord Chaitanya’s favorite scripture which he considered the spotless Purana, or that scripture which is free from all material motivation in its approach to the worship of God. 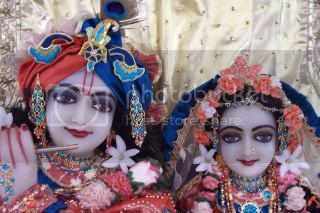 In the first few verses we are informed that this literature is concerned with only pure devotion to Krishna free from selfishness motives and is intended for nonenvious persons who are completely honest. 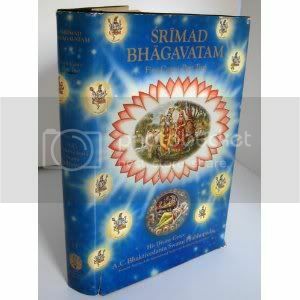 This pure and uplifting spiritual book is also called, Radha Bhagavatam. 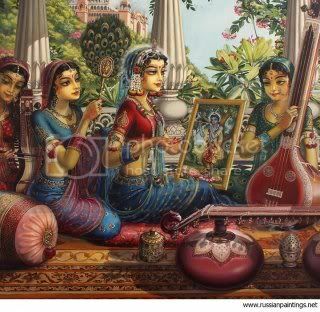 This is because Radha, although mentioned indirectly, is revealed to be the greatest devotee of Krishna by exemplifying the ideal of pure devotion and love for him. Her supreme position has been uncovered through the commentaries of Lord Chaitanya’s principle disciples, the famous six Goswamis of Vrindavana. They are considered to be eternal associates of Krishna and thus are even more important to us than Vyasadeva. It is these Goswami relishers or connoisseurs of transcendental tastes who call this Purana, not the Bhagavat Purana, but Shrimad Bhagavatam. Shrimad refers to Shri Radha! Therefore, although the Vedas are considered a desire tree where one can obtain anything one wants, the Shrimad Bhagavatam is the most prized and glorified by those on the path of shuddha bhakti or pure devotion. The goal of such great devotees of Krishna is not Krishna, but Krishna-prema or love of Krishna, since when one loves Krishna, they are with Krishna! Krishna is present where there is glorification of him, chanting of his holy name, and prayers of love offered to him by his pure devotees. Krishna is impersonally present everywhere in his all-pervading Brahman feature. He is also in everyone’s heart as the Supersoul, yet he is personally present with his loving devotees. Krishna means all-attractive, or as Jiva Goswami shares with us, irresistible. This fact will be revealed to faithful, prayerful readers of this special spiritual literature if they hear it in association of advanced devotees of Krishna. The Bhagavatam contains 12 Cantos, of which the 10th is considered the top-most since it elaborates on the life and activities of Krishna and his devotees. The first 9 Cantos prepare us to understand that Krishna, although appearing in human society is the Original Supreme Personality of Godhead. 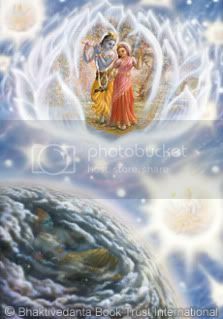 All the Vedas teach the existence and super excellent position of God, but specifically this beautiful Bhagavatam reveals God in his most accessible, enchanting and gorgeous form of Krishna.